Magical and mystical is one way to describe rolling through the Serengeti at sunrise looking out for those animals on an early morning hunt. The scenery in Tanzania is hard to describe, in part because you can drive for what feels like a few miles and the whole world changes. We were in three (maybe four if we count the city of Arusha) very different settings, from gorgeous acacia trees and deep red roads in Tarangire… to the edge of a volcanic crater with bright, new green covered in dew like a rain forest… all the way around to the vast wide-open spaces of the Serengeti. Every scene more stunning than the last. 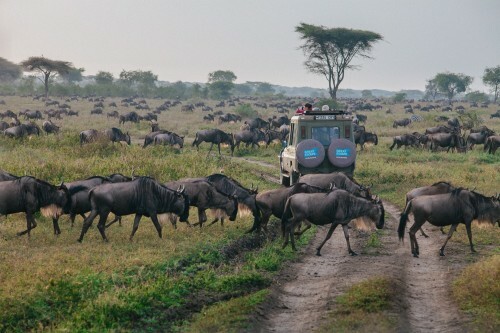 When I left for this safari in Tanzania, I had little concept of how amazing this trip would be. It was unlike any other trip I’ve ever been on. Our drivers and guides are so experienced—they’re amazing. They can spot animals in the distance that were difficult for us to spot through a telephoto zoom lens. And then we’d be off on a grand adventure, rolling through the open spaces to get to them. They also know these animals so well—what to watch for and what their mood and behavior means—so I always felt safe and secure even when a mere few feet away from the big cats. 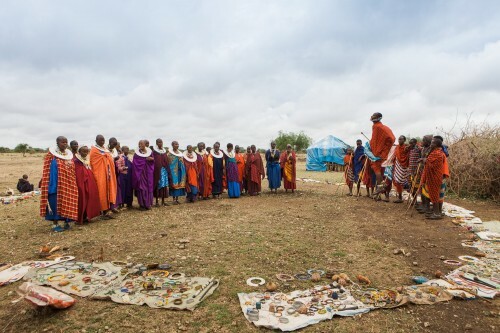 One of my favorite days on the trip was when we were able to go to the Maasai village and get a small glimpse into the lifestyle, traditions, and customs of this semi-nomadic tribe. While all the places we stayed at were top notch, I found the migration camp to be a unique and really interesting, fun experience … think “glamping.” The staff and food were also extremely good at every stop—better than most restaurants here in the U.S.
As for the animals, we saw everything but the rhinos… even a napping leopard in a tree. The lions, giraffes and elephants were my personal favorites, but some of the smaller critters were adorable and fun to see as well, many of whom I had never heard of before—even the brand new baby wildebeests were adorable. Aside from the big animals and the cute little ones, there were so many various birds—tiny, bright-colored ones to very large birds like vultures and ostriches. To have the chance to see even a few of these in the wild is incredible. But to see hundreds of them each day, sometimes by the minute, was mind blowing. One photo tip I would give to everyone—and I plan to do this myself if I go back—is to do yourself a favor and create 2 or 3 custom functions (if your camera has the capability). This means you can change a number of different settings and save all these changes under one group. So, in theory, you could have one set for Sunrise/Sunset, one set for a faster shutter speed for animals in motion, and another for your “standard” shooting situation or landscape or whatever else you may choose. Having them set up as custom functions saves you the time and trouble of going through and changing each setting individually each time the situation changes … and the situation can change a lot out there pretty quickly. You don’t want to miss anything because you’re fiddling with your settings. The only other thing I can say is: if you get the chance to go on one of these photo safaris, be sure you say YES! !